In my latest installment to Global Risk Insights, I comment on Argentina’s dispute with U.S. creditors. This is an under-the-radar issue to most Americans, but it should matter to investors. While on one hand, the U.S. Supreme Court ruling for a New York-based hedge fund over Argentina bodes well for U.S. creditors. This is problematic for Argentina’s prime minister Christina Fernandez de Kirchner for two reasons. First, she can abide by the ruling and pay Eliot Associates, also known as NML Capital Ltd, the principal of their U.S. bonds, which they defaulted on in 2001. However, these repayment terms might conflict with contractual terms that limited their ability to offer better terms to late holdouts. There is disagreement on the interpretation. It is Argentina’s position agreeing to this would renege their previous agreements with 93 percent of other U.S. creditors that agreed to more favorable terms. If they have to offer similar terms to these other creditors, then that could raise their repayment obligations to up to $15 billion, which is more than half of their reserves. If they refuse to abide by the ruling and withhold payment, then they risk a technical default. That would potentially be devastating to a country that is already suffering from a weak currency, rising inflation, and sluggish growth prospects. As of right now, the impact on emerging countries is limited. However, countries with significant debt exposure might have less flexibility in attaining more favorable repayment terms as a result. On June 16th, 2014, the U.S. Supreme Court ruled in favor of NML Capital Ltd (NML) over the Republic of Argentina in a major debt settlement case. The ruling has implications not only for Argentina but also other debt-ridden countries throughout the world. Regardless of how Argentina responds, Prime Minister Christina Fernandez de Kirchner’s options are unattractive. Argentina reached agreement with a majority of its creditors with only a limited number of holdouts. However, there was a small subset of U.S. creditors led by Elliot Associates, a New York-based hedge fund described as NML Capital Ltd, that were holding out for better repayment terms. They sought and received relief from the Southern District of New York, which can result in a high payoff from their purchase of cheap bonds that occurred from the 2001 default of Argentina. Georgianna Vaughn of Global Risk Insights highlights the problem of corruption in the Eurozone. The Eurozone is comprised of 18 member states: Austria, Belgium, Cyprus, Estonia, Finland, France, Germany, Greece, Ireland, Italy, Latvia, Luxembourg, Malta, Netherlands, Portugal, Slovakia, Slovenia, and Spain. Specifically, a new study from the European Commission (EC) shed a new light to unethical behavior that has been estimated to 120 billion in lost tax revenue. This highlights the importance of establishing effective institutions that promote the rule of law and protect private property rights. When global investors are compelled to bribe government officials to win development contracts, they are less likely to invest because they are unsure of the ground rules. Therefore, developing countries are the beneficiaries as global investors take their funds away from Europe and pour them into Asia, Africa, and South America. Vaughn also pointed out varying levels of adherence to anti-corruption laws. With countries such as Croatia and Latvia taking on new action to minimize corruption, there are other countries, such as Sweden, Finland, Denmark, and Luxembourg, who consistently score high in low incidents of corruption. On the other hand, there is rising concern that Germany, Estonia, the Netherlands, Belgium, and France are not doing enough to curb this damaging behavior. When reviewing living standards, a key component is boosting productivity rates. There are various ways to measure that, but the current crisis in Ukraine touches on one key theme. 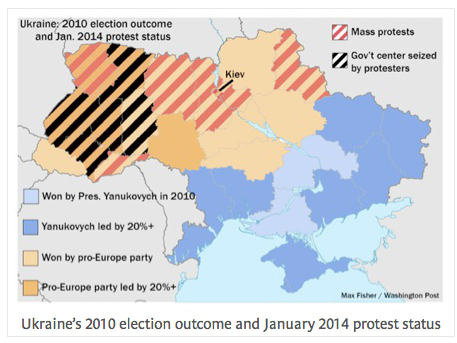 Markets hate uncertainty and Russian troops mobilizing along the eastern part of Ukraine hampers political stability. Even though this is happening across the globe, it is affecting U.S. stock markets that have experienced their worst day in a month. Until this issue stabilizes, expect a volatile ride on Wall street. Political stability is huge because investors and markets like certainty. With the survival of political sovereignty at stake, there is a real possibility that the current government will collapse. With that scenario present, the whole economic system could be toppled. Relations between Russia with Europe and the U.S. have grown icy cold with economic sanctions expected That can affect crude oil prices worldwide, so do not be surprised to see gas prices rise. Diverse cultures that are in conflict with each other. Distinctions between European Union and the U.S.
Lehto characterizes the European Union as being more passive than the U.S. when it comes influencing Ukraine away from the tight reins of Russia. It appears that the Europe is reluctant to raise tension with their eastern rival. However, sustained violence met by protesters during Yanukovych’s reign is drawing both the U.S. and Europe together as they seek targeted sanctions against Ukrainian officials responsible for the violence. Expansion fatigue with the EU reluctant to expand beyond it current membership of 28 countries, which is significantly different from its initial group of six countries. Concern about losing their identity where some believe accepting Ukraine would cater to U.S. and western influences. Reluctant to risk offending Russia. Worried that Ukraine has not instituted enough reforms to ensure smooth integration. Lehto also mentioned the cultural divide that is tearing the country at each seams. While the western part of the country is pro-Western, the southeast portion is leans to Russian influence. We can see that through evaluating three maps. 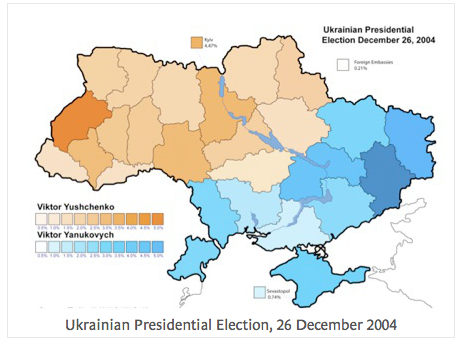 The first map shows Yanukovych losing to Viktor Yushchenko in 2004. The area coded in beige favored Yushchenko, while Yanukovych depended on the blue areas for most of his support. 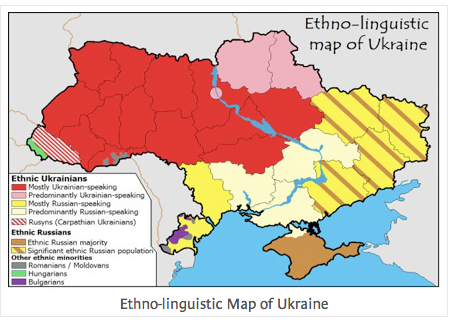 The second map makes a distinction between Ethnic Lithuanians that lean toward Western influence, while the Ethnic Russians are tied to Russia. The last map highlights where most of the protests and chaos is taking place. 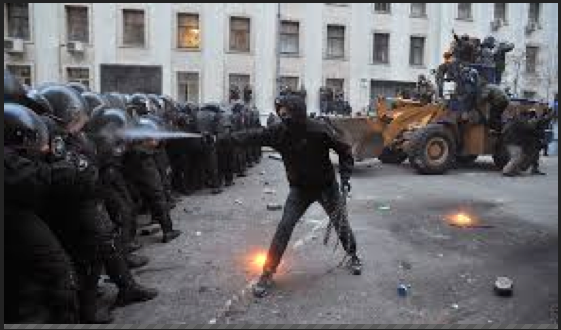 As you can see, all of the violence is occurring in the western section of Ukraine. The International Monetary Fund has downgraded its economic forecast for both emerging and advanced nations. Overall, they still expect the global economy to rise by 3.1 percent, which would be the same rate as 2012. Due to the catch-up effect, emerging countries wlll continue to outpace advanced countries. Emerging countries are expected to see a slight uptick in 2013 to 5 percent from 4.9 percent. 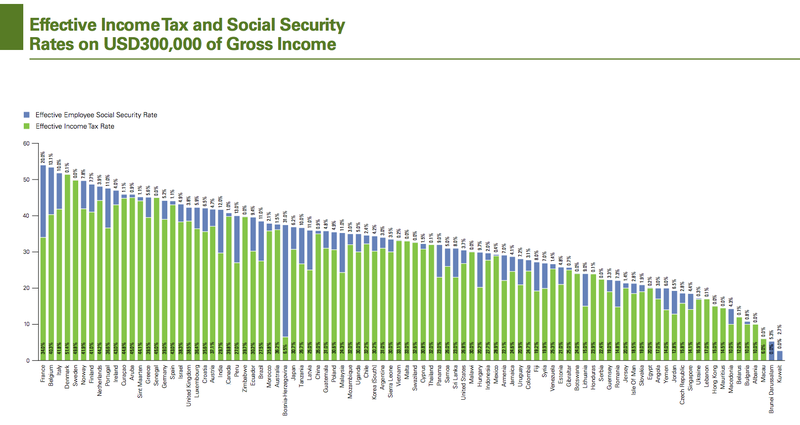 On the other hand, advanced countries are projected to maintain their pace of 1.2 percent, which is low figure. We would like to see advanced countries growing around 3 percent. As for the emerging countries, Asia continues to be a leader. China and India are still experiencing high growth rates at 7.8 percent and 5.6 percent, respectively. However, concerns remain due to potential inflation risks in both China and India. As for the remaining emerging countries, they are facing pressures from lower prices of commodities as global demand declines. That is particularly a concern for Brazil and Sub-Saharian Africa, which are both rich in natural resources. While Brazil is more adversely affected with a growth rate that is lower than average for emerging countries at 2.5 percent, Sub-Saharian Africa is still expected to edge the rate of other emerging countries at 5.1 percent. This is occurring despite South Africa’s relatively low rate of 2 percent. They will be challenged with lower demand for exports and concerns of maintaining political stability. What is holding down the growth of advanced countries is Europe. The Euro area is projected to contract by 0.6% in 2013, which is the same rate of decline as 2012. In particular, Italy and Spain are struggling with negative growth rates of 1.8 percent and 1.6 percent, respectively. Germany is faring better than most of Europe, but not by much with anemic growth of 0.3 percent. This is attributed to the pains of an imperfect monetary union where exploding debt in Southern Europe is dragging down the whole region. While not technically part of the Euro area, the United Kingdom is faring relatively well, though its growth rate is modest. As for this year, they are projected to grow at 0.9 percent. Referring to the G-7, which includes Canada, France, Germany, Italy, Japan, United Kingdom, and the United States, Japan is projected to grow the fastest. After slumping to -0.6 percent due mainly to the tsunami, they have steadily grown since then and are projected to be at 2 percent in 2013. Recent efforts to spur economic growth through fiscal and monetary expansion are expected to pay off with higher growth. When looking to North America, Canada and the U.S. are expected to grow at similar rates at 1.7 percent. Canada’s economic forecast has actually brightened somewhat due to improved prospects in the U.S. However, they are hampered by high household debt and a slowdown in housing. On the other hand, the U.S. is benefiting from a stronger housing market and greater consumer demand, though the effects of sequestration and higher payroll taxes remain a drag. In conclusion, Europe’s problems are proving to be contagious to the rest of the world. Information comes from a 2012 Annual Survey performed by KPMG International, which covered 114 countries. It should be noted that this survey took place before the increase in individual tax rates for individuals making over $400,000. However, the scope of this review wouldn’t cover that range anyway. 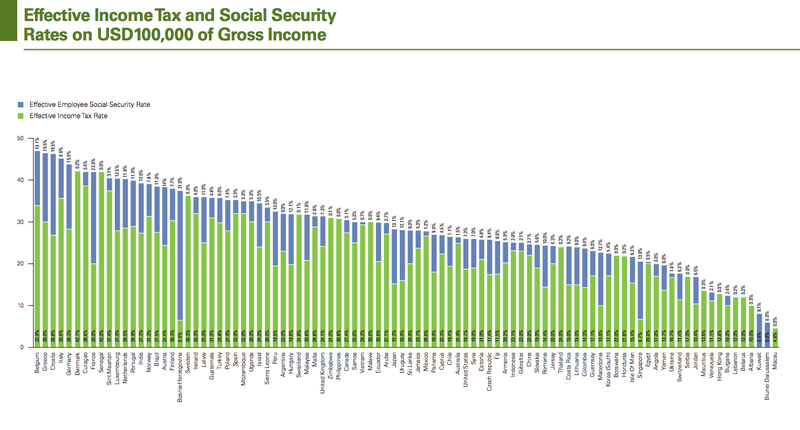 This analysis should quiet critics, who believe that the U.S. tax system is burdensome.